City founder Jonah Mosier, erected a lumber mill here in the mid-1850’s high on the hill above the town. 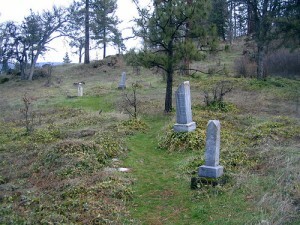 When his wife, Jane Mosier (mother of seven children) died in 1865 at the age of 41 she was the first to be buried in what would become the Mosier Pioneer Cemetery. The City has recently voted to allow new burials on the grounds -the first in 100 years. It is a beautiful walk with views of the town, the Columbia and swirling cauldron of Mosier Creek.